Tamariu 2 - Duplex and patio Tamariu Center, free wifi + terrace! This apartment has two stories, on the garden level there is the living room and kitchen, and on the other floor, a queen bedroom and a very small room with bunk beds. The bathroom is on the same floor,with a shower and a washing machine. The apartment has an independent exit despite being part of a house with a communal garden. The house has 5 apartments in total, and this one is the only one on the garden level, with independent exit straight to the stone stairway that leads you to the boulevard. It is located in the best part of Tamariu, just on the second row of houses from sea line, where tranquility reigns despite being a few steps from the beach. It's privileged garden makes it a unique place. An old stone staircase leads from the apartments to Passeig del Mar, where we can enjoy many delicious typical food from the area. Tamariu is an old beach town of Palafrugell, whose only few years ago, fishing was the main activity. Over the years it has become a place of great attraction, especially for its unique nature. We made our best, to make the apartments and its communal garden, cozy and comfortable spaces. They are comfortable apartments, well located close to the sea and very quiet, which is a very difficult thing to find that close to the beach. They have a main bedroom and another very small room with bunk beds of 180 cm long. The living room has an integrated kitchen and access to a small courtyard with an outdoor table. Bathroom with shower and washing machine. The apartment has wifi, a microwave, TV, music speaker... The temperature is very pleasant in summer, thanks to the pine forest that separates it from the sea and winter heating. Nous avons beaucoup apprécié le lieu qu'ont préparé Jesus et Marga. C'est plein de charme et on y est très au calme. Il faut cependant noter que le lieu est accessible par une toute petite rue qui monte fort et l'accès à la plage (vraiment toute proche) se fait par de petits escaliers qui ne peuvent pas convenir à tout le monde. La déco est sobre, neutre, inspirée des charmes locaux, c'est très bien. Le Wi-Fi est assez faible, pour travailler ce n'est pas idéal, mais qui vient ici pour travailler? 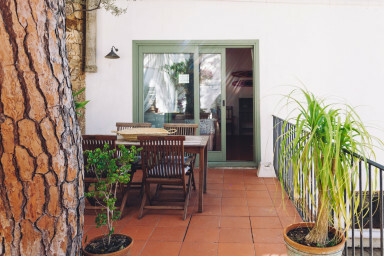 Beautifull cosy appartement & beautifull big shady terrace, with all one needs for a lovely relaxing holiday. Very clean. Would highly recommend this appartement. Disappointing: Secret charge of full deposit without reason!!! Desde el momento de la entrada todo han sido despropósitos. Mala o nula atención por parte de la propiedad. Por el precio pagado materiales y acondicionamientos justitos. Baño inaceptable, camas inaceptables, ni un triste fregaplatos, muchísimas hormigas.... Se salva la ubicación respecto a la playa y la sala comedor con la salida a la terraza. Poco más. Para mí poco recomendable. We liked the Appartment, the service on place was very good. A problem we had, was fixed really quick and the people are very freindly. The Ninia App is only updating the data an Appel when logging in again, on an adriod system it is working fine. Whithout a smartphone it will be not so easy.